Bartek's coding blog: C++17 In Detail Book! I’m happy to present my first ebook on C++! Here’s the short story and the description of what you can find inside. At the beginning of 2017, I decided to make a super long, collaborative, post about all the new things that are coming with C++17. At that time we had quite “stable” drafts, so most of the new features were already known. C++ 17 Features - January 2017. C++17 in detail: Summary & Bonus - September 2017. As you can see at that time, I came up with this title “C++17 in detail”. For most of the time I’ve even made a grammar mistake, as it was called “in details”. 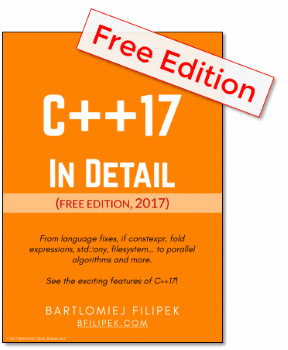 The final result of the first series about C++17 was a little ebook called “C++17 in detail” - it was just a compilation of all of the available articles. It consists of around 50 pages. You can get it for free if you sign up to my mailing list. After the series, I still wrote about the new features, but maybe in a less structured way. Long story short, but during the late Winter 2017, I was thinking what to do next with the blog. I liked writing about new C++ features - doing investigations, reading papers and the drafts of the standard. Also, I got this idea that since I have a book - this little freely available PDF - maybe I could somehow extend it and make it a real book? All in all, I came up with the second series on C++17: this time I focused more on the Library changes. The series started with exploring optional and new vocabulary types (any, variant), and now I describe some things related to string_view. The second series pushed the idea of the more comprehensive book. I added the new articles into the book, and at some point, it got more than 100 pages! In between, I discussed the idea with Jacek Galowicz, and I got huge support from him! Since July I got this crazy idea that I should finalise the book and make it available on 10th August! The date is not random as today is my 2^5birthday! I knew that I wouldn’t be able to finish everything on time - as writing a book is a very extensive project - but I was also aware that near that deadline the book would have a real value to my readers. Leanpub allows me to publish a not complete book and then provide free updates for the readers. So here it is! C++17 In Detail! The book is around 90% ready and contains over 200 pages. 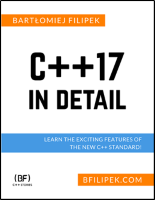 It filled with exclusive content about C++17 features. I spent hundreds of hours investigating how the new things work in order to make a nice and practical book for you. The book will not only save your time but also will guide you through all the nuances of the language. This book is intended for all C++ developers who have at least basic experience with C++11/14. The principal aim of the book is to make you equipped with practical knowledge about C++17. After reading the book, you’ll be able to move past C++11 and C++14 and leverage the latest C++ techniques in your day to day tasks. Please don’t worry if you’re not an expert in C++11/14. The book will give you necessary background, so you’ll get the information in a proper context. The book is self-published @leanpub. You can order it from this site. C++17 In Detail with 45-day 100% Happiness Guarantee. I got a lot of feedback from early relievers, and I couldn’t fix every issue. That’s why I’ll provide an update very soon - probably next week! Then, after the smaller fixes, I’ll return to the core parts: rewriting and updating the chapters. The final version should have around 250 pages. 31st August, more details in this blog post: The First Book Update. Special thanks to all of the people who helped me with the book! The giveaway has ended. Stay tuned for new promotions! I have 5 free copies for you! All you have to do is to write a comment about your favourite feature from C++17 and how you use it. And also, make sure you’re on my mailing list, so I can contact you. The giveaway starts today, and it will last only one week. Next Friday (1pm Warsaw/PL Time) I’ll contact the 5 randomly selected winners, and they’ll get a 100% discount coupon for the book. The whole book editing and publish process is a super exciting experience! It’s a pleasure for me to write about new and fascinating things in the language and I hope you’ll have fun discovering C++17 as well: through the book and the blog. Have a look at the book here: C++17 In Detail.